Nu Flow St. Louis is the leading sewer repair provider in trendy, upscale Ladue. 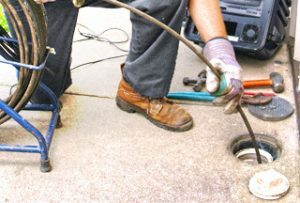 We offer local homeowners and businesses advanced, no-dig restoration techniques that can correct anything from the pipeline materials becoming worn down to a major sewer line failure with little disruption to your daily routine. We will both restore your sewer service today and prevent future problems for years to come. Nu Flow St. Louis specializes in trenchless sewer repair, a modern method that uses new technology to refurbish malfunctioning pipes while they’re still underground. Unlike traditional methods that require days of trench digging to expose a failed pipe, we can complete a repair in as little as one day with just a couple of small, easily-closed holes. Traditional methods usually result in the removal of shrubs, hardscaping, mature trees, and yard structures, but we protect your carefully-designed landscaping to maintain your home’s or business’s beautiful exterior. Our methods also save you thousands of dollars in property restoration costs after the repair is complete. In addition to cost savings, you’ll also enjoy the convenience of a truly hassle-free repair. Our expert technicians work efficiently and discreetly, keeping the work area as small as possible to avoid obstructions. We work neatly so you’ll never have to deal with unnecessary cleanup after the repair is finished. You won’t be embarrassed by noisy, disruptive large equipment that disturbs your neighbors or customers. Even if a major section your sewer pipe has deteriorated, we can restore it with minimum impact to your everyday lifestyle. We begin every sewer repair with a thorough sewer camera inspection to pinpoint the damaged areas and evaluate the severity of the issues you’re facing. Once we’ve collected detailed information on the health of your sewer pipe, we clean the pipe interior with high-pressure water to remove rust and corrosion. This prepares the surface for the liner to ensure maximum adhesion. Next, a soft, flexible sleeve covered with a specialized, high-strength epoxy is inserted through a small access point and positioned to overlay all of the damaged areas. The sleeve is inflated to form a new, perfectly round, cured-in-place pipe, or CIPP, that seals all cracks, gaps, and weakened sections of pipe. Over the next several hours, this new epoxy pipe cures to become super-hard and ultra-smooth. A CIPP actually improves the restored pipe to better-than-new specifications. The smooth surface promotes water flow, increasing the rate of waste removal and preventing adhesion of debris. It is rust proof, corrosion-proof, and resists tree root intrusion, a common culprit in local sewer issues. It is strong enough to withstand severe storm damage and fissures from nearby earthquakes. A Nu Flow St. Louis sewer repair guarantees that you won’t need to worry about sewer issues for up to 50 years. For sewer repair in lovely Ladue, you can count on Nu Flow St. Louis for superior results with minimum inconvenience. We value every customer, and we demonstrate that philosophy with top-quality technology and premium customer service to complete every repair efficiently and professionally. Call us to today to schedule your service!